Achieve an effective clean of your weekly or monthly contact lenses with Oté Twins Active solution, which is even suitable for those with sensitive eyes. 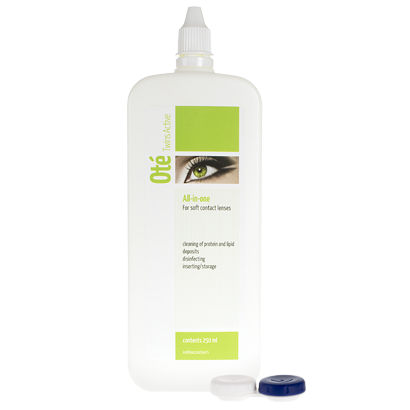 The gentle formula of this multi-purpose solution, created by Oté Optics, does nothing to diminish its impressive cleaning capabilities, ensuring your lenses are free of any dirt or bacteria. Your lenses are also re-hydrated, meaning they’ll be moist and comfortable to wear from the get-go the very next morning with Oté Twins Active. While designed specifically for use with Cantor Nissel contact lenses, you can simply add Oté Twins Active to your contact lenses for a thorough clean, then store them overnight to ensure total comfort. At FeelGoodContacts.ie, we stock a wide range of eye care products. For any questions you may have please don’t hesitate to contact our dedicated customer service team.